This is an open space for papers and new publications. Jeannee N. , Deraisme J. , Shine P.
individual disciplines, namely Geophysics, Petrophysics, Sedimentology, Stratigraphy and basic Reservoir Engineering. properties (Net to Gross, net sand, porosity, permeability). geostatistics represented a fast and efficient tool for the integrated study. work process of reservoir studies. geostatistical model, which in turn become the real heart of the modeling process. integration is achieved, we could talk about geologically oriented geostatistics. Core description allows to define a facies classification scheme and a depositional environment for each litho-unit. shape and size of the main sedimentary bodies. as well as conceptual models. On one hand, seismic analysis provides the structural framework, the main faulting scheme and the structural blocks. deterministically. Small scale features, on the other hand, can be stochastically simulated. templates to guide the geostatistical simulation, especially in cases dominated by strong horizontal non-stationarity. in a later stage, as continuous or discrete variables, within the litho-facies framework. logs and Build-Up tests, may help the geologists to better define and characterize both litho-units and lithofacies. While straightforward solutions are not available yet, several interesting approaches have been proposed6,7. and characterized from a petrophysical point of view by integrating the results of the petrophysical study. they are now widely used by sedimentologists, reservoir geologists and geomodelers for reservoir description. 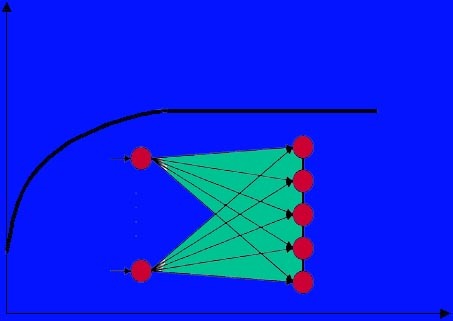 that are used in the non-stationary conditional simulations (Fig 2). Geostatistical modeling techniques are routinely used to build the geological model before scaling-up. to restitute lateral variations and semi-regional trends in terms of both litho-facies and petrophysics. managed with a logic threshold diagram between the two Gaussian functions. where the net to gross ratio is lower than 60% (distributary channels with mouth bars and associated shoreface). of a detailed conceptual depositional model. reservoirs where one facies is predominant and erodes the others. model, is mainly governed by the large scale heterogeneities. in progress in its dynamic modeling phase. in the area since 1955 and gas injection has been implemented in most of the main reservoirs since the early 1960'. this reservoir particularly suited for a geostatistical study. and petrophysical aspects are restituted by the stochastic simulation. the four rock-types associated to the clean sandstone litho-type have been characterized with distinct F-K-Sw functions. empirical relationships between SP/resistivity log curves. the facies and the depth (compaction and cementation effects). direction. The depositional mode has been assumed proportional to the top and base. · Low net to gross of the productive section (lower than 60%). · More realistic results with respect to the pixel-based techniques. Boolean simulations have been carried out for each of the 40 litho-units in terms of lithofacies and rock-types. the good knowledge of the sedimentological model. of these sands, as well as the porosity degradation northward (compaction and cementation effects). of maps for OOIP calculations, corporate database storing and government approval. preserving the vertical average data at the well locations (Fig. 10). way. 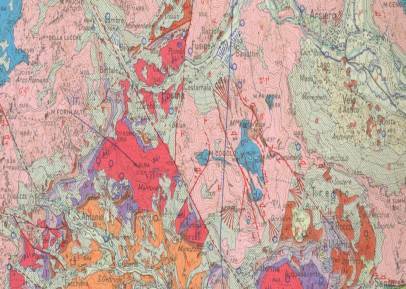 These maps provide traditional views of the main reservoir parameters and have been used for OOIP calculations. and quickly exported to a conventional mapping algorithm. 1. Haldorsen, H.H., Damsleth E.: Stochastic Modeling. JPT, April 1990. 2. Dubrule, O.: A Review of Stochastic Models for Petroleum Reservoirs. Geostatistics 2, M.Armstrong Ed. Fluvio-Deltaic Reservoirs. SPE 16753. Dallas, TX. 5. Cosentino L.: Integrated Reservoir Studies. Editions Technip, Paris, 2001. 6. Mezghani, M., van Lingen P., Cosentino L., Sengul M.: Conditioning Geostatistical Models to Flowmeter Data. SPE 65122, presented at the Europec 2000, Paris. Application to an Oil Fiedd (Offshore Brazil). SPE 63064. SPE Annual Technical Conference and exhibition. Recent Advances, AAPG memoir 71, p 333 - 342, 1999. 9. 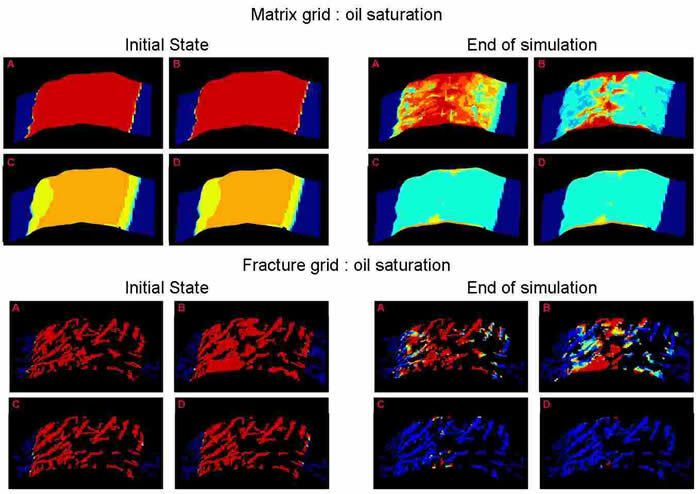 Fournier, F.: Integration of 3D Seismic Data in Reservoir Stochastic Simulations: a Case Study. SPE 30764. SPE Annual Technical Conference and Exhibition, Dallas, TX. 11. Coleman and Prior, AAPG Course Note, Series 15, Deltaic Sand Bodies, 1980. Beicip-Franlab bei Petrophysic-Consultants in Augsburg geführt und weiter entwickelt. ähnliche Formationen die ähnliche dynamische Eigenschaften aufweisen, übertragen werden kann. Die Studie beschreibt verschiedene Permeabilitätsstrukturen die typisch für einige Karstkarbonaten sind. Malm, in dem zur Zeit viele geothermische Projekte geplannt sind. dynamische Simulation simuliert werden, um die Fluiddynamik und die Hauptfließeinheiten zeitlich und räumlich zu definieren. Die IFP Methoden für Heterogeneitätscharakterisierung wurden verwendet, um jede Heterogenität in allen Details zu modellieren. das Matrix „Grid“ und eine Kombination von Super-K und großen Kluftscharen „Fractureswarms“ (der sogenannte Kluftsgrid). gleichen Effekt auf die Fließsimulation haben. simuliert. Es handelt sich hier bei um eine "truncated sequential gaussian Simulation". Edge, Dip und Azimut identifiziert und geostatistisch mit „Fraca“ simuliert. für die geothermische Förderung ist. Die Analyse wurde in zwei Phasen eingeteilt. Die räumlichen statistischen Beziehungen wurden genau untersucht. Die Daten wurden gesammelt und raumlich geordnet. Die Grundlage eines statischen geologischen Modells ist die detaillierte geostatistische Analyse. Die Porosität ist von besonderer Bedeutung. Der Gaussian-Raum ermöglicht die maximale Flexibilität, um die Anwendung der " Grid-Based “ Simulationsmethoden"
Wenn viele Daten zur Verfügung stehen, dann haben wir eine niedrige Ungewissheit und mehr Information. Neben diesem Verfahren wird die Fehlervarianz auch mit „Kreuz.-Validierung“ überprüft. In der Regel stammen die petrophysikalischen Inputs aus deterministischen Interpretationsmodellen. Die „Uncertainty Analysis“ bildet die Basis der Risiko Analyse eines Projektes. Cokriging ist in dieser Hinsicht eine sehr effiziente Technik. Kourzform des Matrixsystems für die Berechnung des Gewichts der Unbekannten. Der verwendete „Athos“ Simulator berücksichtigte drei Arten von Wechselwirkung: Matrix-Matrix, Kluft-Kluft, Matrix-Kluft. und die schichtartigen Super-K Strukturen die zweitgrößten Fliesseinheiten sind. entwickelt wurden, können Geothermieprojekte die maximale Effizienz erreichen. München, für die Unterstützung bei der Realisierung des Papers. 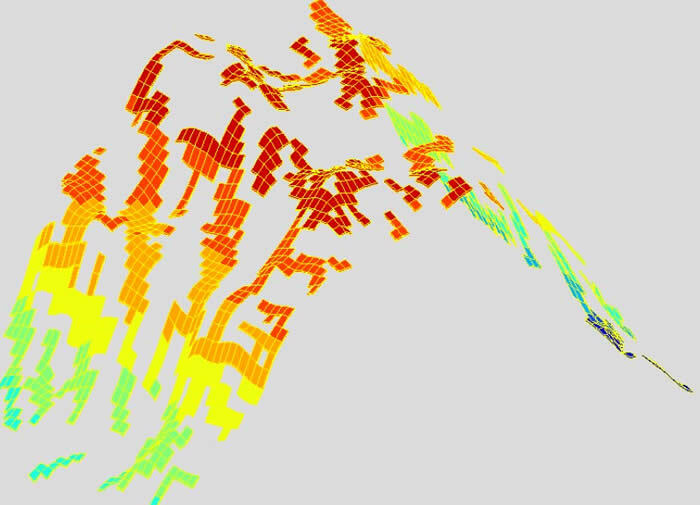 A new integrated approach into geothermy reduces the risk and maximizes the efficiency . a high resolution model of the geothermal reservoir . the flow rate and thermal convection to the producing well . and quality of life for all that live upon our planet . The oil price is increasing and this is an irreversible phenomenon . part of the total energy demand . Geothermy is in a phase of drastical and rapid development and one of the most promising clean energy forms. new critical worldwide situation . around a discussion topic : " How can we develop new concepts and new strategies for the geothermy " ? expensive for the limited budgets of the geothermal energy investors . Indeed we can show with case histories of the oil field that the economic advantages are immense . in the last 30 years , we just need to apply these methods. reduce the risks and increase the efficiency . Our goal is to double the efficiency of a geothermal project in the next few years . To do this we must use a scientifically rigorous approach . We start our analysis with a parallelism with the evolution in the oil field in the last 25 years . pressure was sometimes supported from waterflooding operations . Nowadays most of the oil production derives from secondary enhanced oil recovery (EOR) procedures . operations as new methods were developed for risk analysis . mostly gas saturated reservoir areas. more powerful measurements technology and computer hardware performance . oil industry are very important instruments to study the geothermal reservoirs . Sometimes the approach is different , nevertheless also in geothermy we are concerned with Porosity and Permeability . 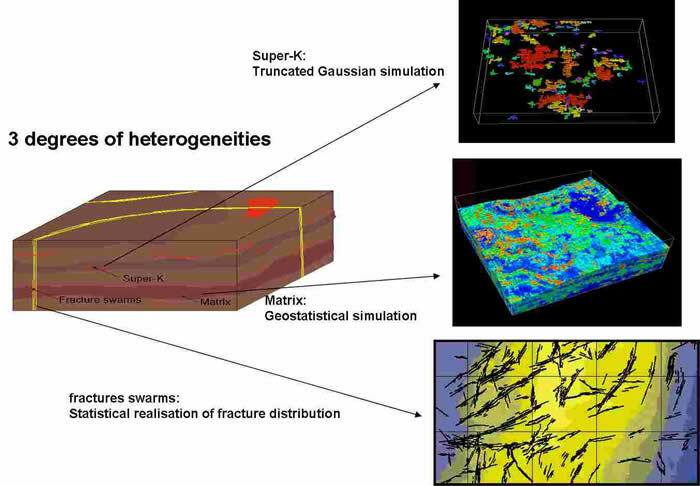 From the seismic interpretation starts the static geological model . A seismic inversion study must be completed in order to make some impedance grids for each modeled geological unit. physical properties for each geological units, previously done in the geostatistical study. In the geothermal field we can call the optimal porosity-permeability combination as "Hot Spot ". We think the Hot Spots as the space domain where the " critical " permeability is stored. thermal exchange between medium and fluid . Not all the permeability is critical . We think that the study of a geothermal reservoir must be finalized and deterministic . specific project finalized to the maximal efficiency . foundation of all geothermal projects . Deterministic is the new step aimed to reach the full control of causes and effects . 3D model and in an interactive database . This is not to be interpreted as an alternative to geostatistics which must be used on the interpretation model. This model will determine every detail of the project . We can exactly identify the flow units which are active in a reservoir or activate new ones . exchage and transport capacity . We can explore new spatial domains of our reservoir and extend it in any direction . We can use the case history , the database and the model of our reservoir to study and understand other reservoirs. For all this we need a Geologic Static Model and a Dynamic Simulation . project minimizing the risk and maximizing the costs control. The well path will be digitized in the model avoiding critical areas and optimizing the drilling efficiency. conclusions inferred from the analysis of the results of the static model and of the dynamic simulation. process , maximizing the efficiency of the entire geothermal reservoir . 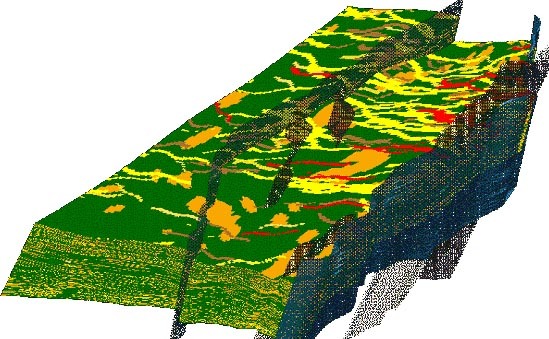 data for the static geological model construction . A real three-dimentional tomography of the subsoil . Here we can obtain the first view of the structural architecture of our potential geothermal reservoir . Fig. 4 A special team of geophysicists will perform a detailed seismic analysis on the 3D seismic data . 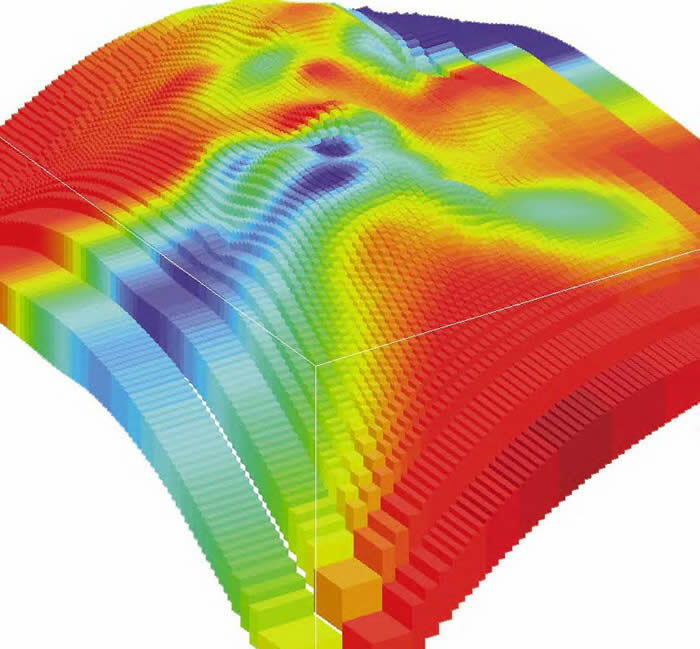 The seismic attribute analysis is focused on the structural interpretation and on the porosity characterization. 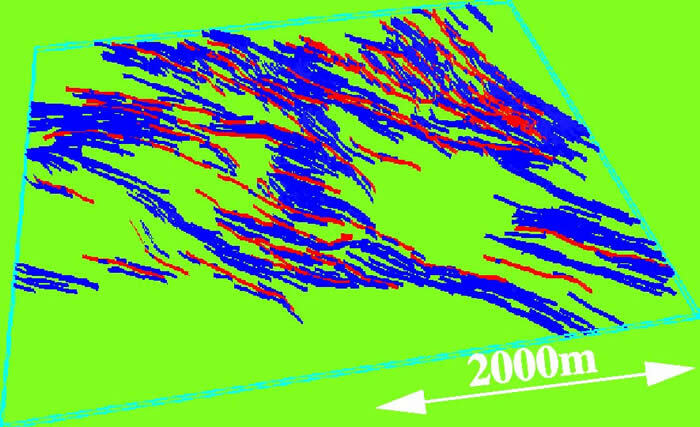 microstructural 3D analysis up to the millimeter scale where the data density reach the optimal intensity . Other areas will be geostatistically simulated using measurements from actual and previous wells . Fig. 7 Finally we analyze the fluid flow and the thermal flow,the spreading of its fronts , its speed and direction . We can quantify porosity , permeability , and thermal exchange efficiency . its coordinates and the drilling target with the maximal resolution . We can plan the optimal stimulation operations in order to increase the thermal sweep efficiency . and the right target to maximize the stimulations results and the efficiency. can decrease the risk to more that 50 % . This will lead to less than double the effective costs . Our proposal is a totally new type of drilling project .